"Everyone should have a code to live by... Mine is CARBON Based." These are the logs of Capt. Turamarth Elrandir. Anyone who has followed me knows the last year, heck the last 2 years have been "fraught" with RL issues that have conspired to keep me logged out of EVE, that being mainly Divorce. To anyone who hasn't been there, you DO NOT wanna know, and to those who have... well... you know, 'nough said right? Basically divorce eats your life. Money, effort, worry, sleep (IE fatal lack of), hopes, dreams, trust... but mostly it consumes your time, and when you do have free time, you just don't care. About anything... at all. Yes I "should" concentrate on fun and friends and "moving on" and such, but I'm one 'a them weird types, the guy who is the first to be a friend-in-need, and the last to ask for help. When my life goes in the crapper, I usually find a hole, climb in, and pull it in after me for the duration. So... my 2B'X' and I have worked out most of the ugly details, we have lived apart more than a year, all that's really left is the paperwork and the spending the rest of our lives trying to be "parents-on-good-terms" for our dottir. I am a sailor. I was lucky, I learned to sail and in general "mess about on boats" since afore I could walk. My family is from Northumberland County in Va. A place called Ball's Neck, on the western shore of the Chesapeake Bay. My family home sits at the mouth of the confluence of Mill Creek, Guarding and Gascony Coves facing east across a half-moon bay called Ingram's Bay. My family home is named East Gascony, a old southern bay farm house built by my grandfather for his wife over 100 years ago. we had a private beach, a dock and, well... over the years a LOT of boats. So as a child I learned to walk and swim hand in hand, and to hunt and fish and crab and oyster and garden. I also learned to handle all those boats, boats of all types. From canoes to powerboats ranging from flat bottomed skiffs with 1950's 2 horse outboards up to the biggest dad ever had, a 43' Hatteras twin diesel. But for me the real joy... was learning how to sail. Sunfish, sailfish, sailing dinghy's on up to a 35' cutter rigged sloop. And as we were pretty fair at breaking stuff, I learned how to fix it all too. I am competent with brightwork, wood and metal, fiberglass and small to large outboards and inboard engines and diesels. So, this last go-round with divorce, the one where we finally took the steps to actually call it quits, I found myself in that weird place... the one where you find yourself at 55 (then) and gonna be "single" again, but with 2 teenage kids and the smoking leftovers of a 16 year marriage. I sat there, on that morning, the morning where I knew like I know my own name "knew" that this was actually it... that it was over and there I am... so what now? I decided I wanted to go sailing. Going Sailing has been "that" dream all my life. You know, the one you will never "actually" do. The Dream of a Dream. The "Sell it all, buy a sailboat and head south until all you need is a pair of flops, sunblock 100 and shorts... and the shorts are optional dream." The Big Dream. I made a decision that morning in Oct of 2016, that I would, somehow, as soon as possible, do just that. I set a goal for myself to find a way to acquire a sailboat large enough to live on full time and a way to support just exactly that. I started looking at the boat market, reading sailing books and blogs and watching sailing vlogs such as Sailing S/V Delos, followtheboat, Wicked Salty and MJ Sailing just to name a few. My kids are in their teens, both just starting to stretch their own wings and when I told them of my dream they both said "Go for it dad!" Yes the idea of me being gone for weeks and months isn't a happy making one, but the idea of joining me on the boat in the summers most definitely is one they like and they want me to follow my dream and show them it can be done. They want me to be happy... gods bless em. So, that's where my time and effort has been going these last 2 years. Last summer I found a skipper who is "new crew friendly" (many are, but you gotta find out the where and the who to ask). He takes on new people as crew, whether experienced or totally green, for races and regattas down in Hampton Va. He has a Beneteau First 305, a 9.3m (30.5') sloop and is very active in the Southern Chesapeake Bay racing season. So, will I ever come back to EVE? Heck, I just don't know. We ALL know what a time sink it is and right now, even in the dead of winter, I just don't have the time. Plus... well, like so many, Kirith Kodachi and Yadot and the whole list of those who have gone dark this last year (9 from just my meager reading list)... it just isn't the same EVE it was when I first undocked eight years ago. No, I've not unsubbed yet... but there needs to be a reason for me to get active again... and time. I just need the time. Just a quick one... I has done it, I jumped corp from HELPeR, and have joined with Epigene, he who Journey's Through the Mind and Oreamnos Amric, he who takes Notes from New Eden and their ilk in Z3R0 Return Mining [Illusion of Solitude]. I have just finished moving my Traveling Roadshow Orca, carrying some 12 ships, into the corp C2 home... called, Fred. ... yea, we call our homehole, "Fred"... sheesh. Anyhoo, I am getting all settled in and lookin forward to gettin back into the swing of things. So, new corp, new alliance, new bros, new holes and new going on... let us see what we shall see hmmm? Things have quieted down in my Real life... not all the way, but a bit, so I fired up the ol hoopty laptop, let the updates run and the cached data cache up and logged in. Initially I've been solo mining and flying out n about near Amarr to see if the game has made me a noob again after basically a year on sabbatical. Gotta say, whatever changes have been wrought in the last year have not affected my Orca'ravan or the ships I carry aboard her. Back a few months afore I went on sabat I fitted an Orca as a traveling roadshow. I carry a small fleet of ships... a mining barge, a HAC droneboat, a tac dessie, a pirate frig, an assault frig and a cloaky expedition frigate. These allow me to engage in a wide variety of gameplay from L2 through L4 missions and a variety of sites to "safe" passive mining and not so safe ninja mining. So far I feel the basic gameplay and fitting doesn't seem to have changed enough to be incomprehensible to me, or even really any different at all, so far. As for our home in the hole? Gone. Yea... We had a std old good ol' style POS and one a them there new fangled Stations... but my corp was AFK and, "Boom". 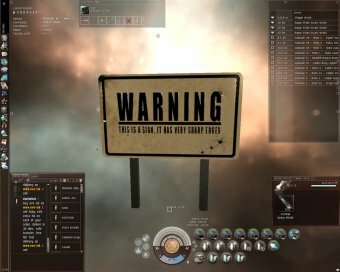 Oh well, I always kissed ever ship I jumped into the hole goodbye the day I took em in there, I knew and accepted the risks, it's Anoikis, negative sec, the most dangerous space in EVE. I don't know my exact losses, but probably somewhere north of 8 to 10 bil ISK I think. This is why I kept a shadow fleet in Amarr... I logged in inna Venture, selfboomed it and my pod to wake up back in Amarr in a clean new clone. So it goes in EVE. I don't know if any of the guys from my corp are interested in coming back. I'm picky about who I fly with and trust is the one commodity in EVE you cannot buy, beg, borrow or steal... and I trust NO ONE... so I'm really not sure at this point what I want to "do" in EVE... but I do know I still long to fly the deadly skies of New Eden... so for now, if you see me in local (local, yuch), give me shout... Who knows, maybe your's is a corp worth flying with. Last post, Dec 16... 8 months ago. What's up? The same, and not. The divorce is, well, it's what it is... don't ask. Did not go as planned... go figure. Me? Working full time, creating a totally new life out of the ashes of the old... you know, simple easy stuff. So, as you may have gleaned I'm still pretty busy. Kids are well, at least as far as it goes given the circumstances. My dottir graduated on the honor roll, with awards for Latin and Strings (she's a 3rd year cellist). My son... he too graduated but, well not quite the same shine, but he's still mine. Work goes well. Still just the IT Support standard of puttin' out fires... some old, some new. The rest is either boring or is covered under lawyer, client privilege. In case you haven’t noticed, I’ve been away for a while. Last post was in August actually, 4 months ago. I have not been logging on except like once or twice and obviously haven’t blogged at all. Well, last try was what it was. As of this October we are again separated and I am again looking for a place and going through the paperwork to divorce. We are still basically copacetic, we are not lawyering up, we have basic agreements in place re the kids, house, property and finances. No one who knows us can ever say we did not really try to make it work, but it just doesn’t anymore and this is the least worst of a host of bad outcomes. So it goes. As for EVE… my time has been simply eaten with the needs of RL. And this is as it should be. EVE is, first and last just a game. Granted it is the most amazing and engaging game (hobby, pastime, electronic virtual addiction) ever invented by the mind of man… but in the end it is a game and real life, my kids, career, health and wellbeing are always greater than any game… no matter how good it is. As for Tur… he’s in Amarr and I am still paying to keep the skill Q full, as I do not “intend” on bagging it all in quite yet. I do want to come back and fly the deadly skies with friends and frenimies both old and new one day… but only time will tell, I know not what my future will bring. Wish me luck... and raise a glass with me to all those who have made a home, for however long, in the skies of New Eden. These are the ramblings, recountings and tales of my exploits, adventures, wins & losses and the friends, and enemies, I have made, met and will meet in the time I spend in EVE Online. "Anoikis is to EVE players as EVE is to WoW players... You either hate it, or it eats your brain." "Maybe we're not that different after all and I have my own reality to get to grips with." We are, each and alone, the absolute center of our subjective 'verse... this is the way of life. To kill them all without rancor or anger, but in brotherhood... this is the way of EVE. "Freighter pilots know that stargates are like Kansas trailer parks – Tornadoes love ‘em." "You killed yourself... I just carried the bullet for a while." Uncloak.. launch bomb when ready. FUCKBEANS BANANASLIPPERS FIRE FIRE FIRE!!! "I'm just doing a job.You did something to cause me to be here, look to yourself for the reasons why." This Is What We DO!!! We're Soooo Bad at Hisec! This site is written and formatted in Mozilla Firefox and tested in Google Chrome also. As a career tech I have learned not to trust or use MS Internet Explorer. For the few of you who actually read my drivel, please use Firefox or Chrome if you want to see the site as it is intended... or not. EVE Online and the EVE logo are the registered trademarks of CCP hf. All rights are reserved worldwide. All other trademarks are the property of their respective owners. EVE Online, the EVE logo, EVE and all associated logos and designs are the intellectual property of CCP hf. All artwork, screenshots, characters, vehicles, storylines, world facts or other recognizable features of the intellectual property relating to these trademarks are likewise the intellectual property of CCP hf. Permission has been requested from CCP hf. by 'A CARBON Based Life' to use EVE Online and all associated logos and designs for promotional and information purposes on its website but does not endorse, and is not in any way affiliated with, 'A CARBON Based Life'. CCP is in no way responsible for the content on or functioning of this website, nor can it be liable for any damage arising from the use of this website. Specific content not covered above are ©2010 JD Blackwell and All Rights Are Reserved unless otherwise noted. I appreciate that you might want to link to material presented on 'A CARBON Based Life' and encourage you to do so, all I ask is for proper attribution and a link back to the original post. This is a fan site and all work presented within, with the exception of original content and certain written words, is based on material owned by CCP and all rights are reserved. Copyright by JD Blackwell. Awesome Inc. theme. Powered by Blogger.